Sophomore Mariah Cruise recently broke the Cedarville women’s track and field team shot put record, but she said she does not want to be known just for her success on the field. “I definitely want others to see me as being humble and using my talents for God,” Cruise said. Cruise was first introduced to the idea of throwing in track at an early age. Her father was her high school’s track coach. She grew up around the sport and began competing during seventh grade. In high school, Cruise began to dominate her competition. She built up a reputation as a strong athlete with a good work ethic, and college coaches began to notice. Cedarville track and field assistant coach Jason Scott worked to push Cruise to come to the school. “Her high school personal record was already close to our school record, so we knew she would be a good pick up for us,” Scott said. Cruise did not quite get off to the start she was expecting in her first year of college. She struggled to compete with some of the better throwers at the collegiate level, but she was used to winning meets from high school. Doubts began to form in her mind, she said. Cruise’s drive for success has led to great improvement. She trained hard in the off-season and came back for the 2015-2016 season more prepared than ever, she said. Cruise said she was more mentally prepared for the season because of her experience she gained as a freshman. She broke the Cedarville women’s shot put record on the first meet of the outdoor season with a distance of 12.88 meters. Cruise now turns her focus towards getting a provisional mark for NCAA Division II Nationals. She would have to throw .61 meters further in order to achieve the mark. Despite her recent success, Cruise has stressed the importance of being humble towards others. She said she wants others to see God through her talents and attitude rather than seeing her as just a great athlete. Joshua Woolverton is a freshman journalism major. He enjoys running cross country and track, writing and listening to music. 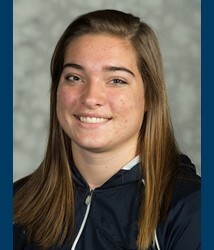 No Replies to "Sophomore Thrower Mariah Cruise Sets New School Record"